Climate change is definitely a huge challenge for the 21st century. Models in energy economics show that efficiency gains through energy productivity improvement, technical change and technological innovations towards lower carbon technologies will not be sufficient to achieve the ultimate objective of the United Nations Framework Convention on Climate Change (UNFCCC), ie stabilize greenhouse gas (GHG) concentrations at a level that would prevent dangerous anthropogenic interference with the climate system. Mitigation actions that stem from individual behaviour change towards a lower individual carbon footprint are also part of the response to the climate challenge. Depending on their current behaviour, individuals may focus on many different actions to reduce their carbon footprint, be they at home, at work or any other place: for example, they can use the public transportation system or ride their bike instead of driving their car, videoconference instead of flying to a conference or a meeting, turn the heating system off if they open the window when it is cold outside or if they are out of town for some time, turn the lights off when leaving a room, set their computer in sleep mode when not using it for some time, install sockets to shut off the standby modes of their multi-media devices, reduce the amount of waste they generate by purchasing products in bulk or with little packaging, consume local products rather than goods imported from other regions or countries, follow a diet with a low-meat content, and much more. All those actions, as insignificant as they seem to be in terms of individual energy savings and greenhouse gas emission reductions, do have a real impact at the macroeconomic level. Furthermore, they are often “low-hanging fruit” options, easy to implement at nearly zero cost. Studies that illustrate this point are numerous and cover all GHG emitting sectors. For example, lowering room temperatures by 1°C is estimated to save 7% of energy consumption. “Energy vampires” at home (ie the standby power of all electric and electronic devices) represent almost 11% of US energy use. Two similar daily diets in terms of energy intake may differ by a factor of four in terms of life-cycle energy inputs, depending on the content of the diet . Although the cumulative potential gains drawn from individual actions are substantial, they may be hard to reach in reality, because barriers are numerous for individuals to change their behaviour and actually reduce their greenhouse gas emissions. Even individuals with positive attitudes may show much reluctance to behave in a climate-friendly way. Against this background, our paper aims to investigate how these barriers can be overcome so that individuals take action [notice 034]. The investigation that we carry out relies on a climate-friendly initiative that has been going on at the university of social sciences of Grenoble, France, for six years. The goal of the initiative is to stabilize the greenhouse gas emissions of the university in 2010 relative to 1999. Various actions have been taken, such as building a greenhouse gas emissions inventory to monitor those emissions, improving the efficiency of the heating system, organizing internal communication campaigns to help people reduce their carbon footprint. Only a few people are currently acting, although all members of the university could be contributing to reducing the university’s emissions. Various barriers prevent them from acting. Before understanding what may be an individual’s motivations and barriers to act against climate change, it is important to identify who are the actors of and what role they play in a climate-friendly initiative implemented by an institution. 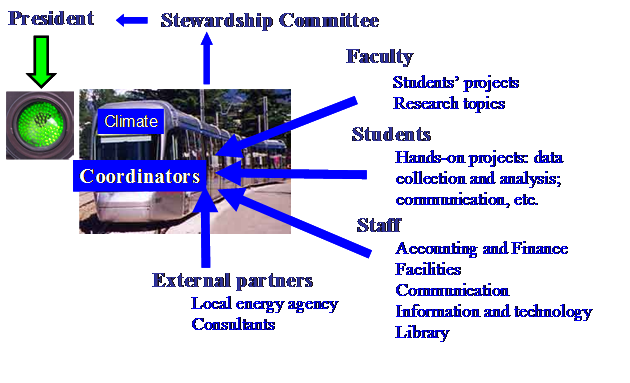 Based on our experience, and also when surfing on universities’ websites, reading universities’ environmental reports, and meeting with members of different universities, it appears that the types of actors of a climate-friendly initiative in universities include the decision makers at the top level, the coordinators of the initiative, staff and faculty members, students, student associations, and external partners. All these actors play different roles that are analysed below. In fact, a climate-friendly initiative in a university can be described as a “train of expertise, advice and actions”. The train destination is climate change mitigation. The dynamics of the train stems from the coordinators of the initiative, who most often are faculty and / or staff members, and more seldom, students or student associations. The passengers of the train are the members of the universities who take part in the initiative: they may be staff or faculty members, as well as students or members of a student organization. Some of them may be members of a “stewardship” or “advisory committee” in which the representatives of the various categories of actors meet, suggest strategic orientations and climate change mitigation actions, review the actions already implemented , propose new actions. The train will move forward only if the decision makers have turned the light on “green” on the railway track, showing their official approval support for the initiative. Depending on the country where the university is located and the internal decision making process of each university, the decision makers may include, for example, the president of the university, the board of directors, the financial officer, the director of facilities. Without the decision makers’ support, any initiative is generally doomed to fail for various reasons, most of them relating to the individual’s barriers that are discussed in the next section. The coordinators of the initiative are the interface between the decision makers and the other actors. They must get the green light from the former and implement the actions with the latter. They may be staff and faculty, or students. When the train is driven by staff and faculty, coordination is generally taken on by the same persons over a longer period of time than when students are leading the initiative: students are overnight passengers, whereas staff and faculty stay over the long-haul. Furthermore, staff and faculty members may get a better audience and exert greater authority than students, when inviting their staff and faculty peers to get on board. In addition to a coordination role, faculty can contribute to the initiative in various respects. They can monitor hands-on students’ projects that are part of the curriculum of the students. The projects may range from small to wide-scope actions and be in a high variety of fields, depending on the students’ subjects and level (undergraduates, masters’degree). Recent projects carried out at the university of social sciences in Grenoble include for example the annual update of the greenhouse gas emissions inventory of the university, a feasibility study of a car sharing system, the feasibility study and implementation of a free cooling system in the Information Technology’s servers room, communication campaigns, etc. Faculty may also bring their input in the initiative by offering students curricula, courses, research topics in the field of climate change mitigation. Staff members may be actors in two different ways. First, when assuming that the decision makers officially support the initiative, some members act simply because their position requires to do so. Some people working at Facilities, Information Technology, Communication, Procurement, etc.. may for example be required to monitor the heating system management, automatically set computers in the sleep mode after some idling time, develop a communication campaign, issue a bid requiring suppliers to provide recycled paper, etc. They have to do the job, even if they may personally not agree with it. Second, staff members may voluntarily step into the initiative and implement actions in their department, their building or on their floor in accordance with the coordinators. In addition to the hands-on projects they may have to develop to get their university degree, students are generally involved in the initiative as members of a students’ environmental organization. The actions undertaken by the students’ associations may help expand actions already implemented, or explore new ones. The non governmental organization Solar Generation has for example worked with the Green Campus network on various French campuses to make students design and install photovoltaic panels on some buildings. Finally, some external partners (energy conservation or environmental agencies, consultants, corporations, etc.) can also be passengers of the train as they may bring expertise, know-how, advice, or funding into the initiative. Fig 1 below shows the actors of the climate-friendly initiative of the university of social sciences in Grenoble, France. Still, the contribution of all members to greenhouse gas emissions reductions is necessary, for several reasons. First as mentioned earlier, overall climate change mitigation can be achieved only if all possible options to reach that goal are implemented: no option can be left out. Second, the greenhouse gas emissions inventories carried out in universities always show that transportation is one of the biggest sources of emissions, mainly through commuting, but also through professional travel. Significant emissions reductions are therefore attainable only if all members or so change their transportation habits. Third an individual’s behaviour change in the workplace may catalyse his (her) behaviour change in other places, and particularly at home. Fourth, universities’ mission is to educate students, who are future consuming adults: the adoption of a low-carbon behaviour by the young generations may entail a significant spillover effect to the next generations. Finally, universities are both experimental territories and showcases: they must be frontrunners to show other communities that adopting a low-carbon behaviour is actually feasible. The question then is: how to get people adopt a low-carbon behaviour at the university, ie act towards the reduction of the university’s GHG emissions? Identifying and analysing the motivations and barriers that prevent people from acting in such a way will help find solutions to overcome the barriers. The next section focuses on those motivations and barriers. Motivations and barriers to fight against climate change are numerous and vary from one person to the other. Those mentioned below relate to university members but can apply to any other institution, in their own context. Motivations that may lead people onto the train of expertise, advice and actions can originate from requirement, personal interest or the institution’s perceived potential benefits. Motivation driven by requirement applies to staff members and students who are asked to act in the “exercise of their duties”. More than a motivation, requirement –or duty- is a reason for acting. Staff members may be required by some superior to do a specific task that will reduce the university’s greenhouse gas emissions, as a follow-up to a decision made at the top level to put the university on a lower carbon path. Students may have to work on an emission reduction project because projects are an integral part of their curriculum, and those proposed by their professor happen to deal with climate change mitigation. These staff members and students might not have chosen to work in this direction on their own initiative. However any staff member and any student may have a personal interest in contributing to the initiative, as any other actor of the university. Personal interest is in fact the primary motivation to act. Manifold feelings can create personal interest and induce people to act: an overall awareness of environmental issues; guilt towards future generations ; relief due to action ; fairness feeling ; concern about the forthcoming climate change impacts ; pride to contribute to fight a huge world challenge along with thousands, may be, millions of other persons ; pride to be –somewhat– a frontrunner ; pride to be part of the change needed. Interest may have aroused prior to the actors’ participation in the initiative, or may arouse while acting by requirement. The latter case is particularly true for students: they frequently underscore how fruitful their project work is and helps them discover the climate change challenge, become aware of the carbon footprint of our daily activities and how to reduce this carbon footprint. They often add that the project has induced them to act personally, although they had been either neutral or reluctant at first. Similarly, some staff members, required to act, mention that they find a new interest in their job and tasks when they understand the importance of the contribution they bring. The institution’s perceived potential benefits may constitute an incentive to act, or to commit the institution to act, especially for the decision makers. University budget savings may result from zero cost-greenhouse gas emission reductions actions (eg through a better monitoring of the heating system) or from other emissions reductions actions that pay back more or less rapidly (eg insulation improvement, investing in a highly energy efficient new building). Decision makers can also refer to their climate initiative to boost the image of their university as a frontrunner in this respect, or as a differentiation element in the competition among universities. The low number of actors who participate in a climate-friendly initiative may be explained by many personal and institutional barriers. A first type of personal barriers is the hierarchical requirement to act, for those who are asked to act in the exercise of their duties. Staff members may be reluctant to do what their superior has asked them because they feel already overwhelmed by all the tasks that they have to handle, or because they feel that this is their colleague’s job, not theirs. Such a behaviour may probably occur more in public institutions where civil servants have few incentives to do a great job but their personal conscientiousness. Students working on a GHG emission reduction project may lack motivation because they have not chosen the topic and have no specific interest in it. As a result, their contribution to the initiative may be very poor, and may even need to be redone by another group of students. Interpersonal relationships may be a second type of personal barriers. University members may be reluctant to get on the train of advice, expertise and actions because they don’t get on with some actors of the initiative and cannot cooperate. Reluctance to act may be damageable to the initiative if the person has a critical position among the actors required to act in the exercise of their duties (eg managers of some services such as Facilities, Information Technology, Communication). Reluctance may be observed in various ways: absence of communication with some actors, non attendance at meetings, delays to implement planned actions, etc. Resistance to change is also a well-known barrier to any project aiming at bringing some kind of innovation. A climate-friendly initiative is a social innovation in the sense that it aims at structuring university activities and university members’ work along a new (additional) social purpose that needs to be integrated into the existing missions of the university. Various reasons may explain resistance to change in addition to those mentioned above (hierarchical requirement, interpersonal relationships): the public institutional setting, routine habits, fear of change are the main reasons identified in French public universities, where more often than not, staff members –and to a lesser extent faculty- stay in the same institution for many years, if not during their whole career. These personal barriers can translate into climate change denial. The psychological attitude of denial towards a world challenge that threatens humankind has been studied for several years, focusing on the climate change challenge as well as others. The findings of polls conducted in various countries corroborate the denial attitude towards climate change, especially in developed countries. Many reasons underlie a denial attitude towards climate change. The actions required to fight against climate change are frequently perceived as a threat to the current way of life of people in industrialised countries. Many people are not willing to change their life style. Furthermore, some individuals feel powerless, overwhelmed, in the face of such a planetary problem and think it is impossible to fix it, at least through their own action. Some people perceive their individual responsibility, if any, as very low and wonder how their individual action could make a difference, when their peers behave similarly and inaction is the current implicit standard among their reference group. The fact that climate change is a highly complex phenomenon, almost abstract for lots of people, and comprises uncertainties about its future impacts in terms of exact location, timing, magnitude, intensity, etc. also contributes to the denial process: people tend to act more to fight against tangible, local, short-term risks, rather than against global, long-term risks blurred in an array of unclear climate change patterns. Stoll-Kleeman et al. underscore that climate change denial may help people to stick to their dissonance between their attitude and behaviour. The cognitive dissonance relates to the gap between people’s attitudes, statements, and their actual behaviour when it comes to act. A poll conducted by the French Environment and Energy Management Agency (Ademe) illustrates this cognitive dissonance. On the one hand, most French people state that they are concerned by climate change and aware that they will have to change their lifestyle; they primarily point to actions in the transportation sector as the most efficient ones to reduce households’ energy consumption. However, when asked about their personal actions, they rank the use of public transportation in the place of their personal vehicle with the lowest score of all their actions : people actually don’t do what they preach. Denying climate change may help people solve their statement-versus-action paradox . University members express their denial towards climate change in various ways. When talking with them, some indicate that they didn’t know: thus far, they haven’t realised that their daily consuming-energy activities (commuting, heating, using electric appliances, etc…) increase the levels of GHG concentrations in the atmosphere, and entail a rise in global temperatures that leads to climate changes. Some doubt that individuals can significantly contribute to climate change mitigation. The reasons brought up in this respect range from the individuals’ powerlessness given the daunting task facing humankind, their insignificant individual carbon footprint relative to the global GHG emission reductions needed, to their needless actions as long as the rest of the world does not act. Other members mention the lack of time to act, the unfairness of asking individuals to act when industrial companies are by far the largest emitters, their reluctance to change their habits, their fear of a reduction in their comfort, and also the faith in technology to fix the problem. The arguments brought by university members are not different from those found in the literature or collected in polls, except in one respect: costs. The cost factor is not mentioned by university members as a barrier to commit to a climate-friendly initiative on campuses, whereas household poll results point to cost as one of the most important barriers for people to reduce their GHG emissions at home . The reason is straightforward, and can probably be extended to most collective workplaces: staff members don’t pay for their energy consumption, paper consumption, garbage collection, professional travel, etc. The cost-factor is nonetheless very much a barrier to act at the institutional level, as will be developed below. Institutional barriers include time, lack of incentives for faculty, tight university budgets, and lack of involvement from the head of the university. Time is a barrier in at least two respects. First, data collection, that is a prerequisite for many actions, requires much time before full completion and analysis, when data are widely spread across many services, as well as many locations. This is particularly the case with big universities that total tens of thousands of students, staff and faculty, and comprise many locations and buildings. Second, much time is needed before all university members adopt a low-carbon behaviour: sociologists point out that behaviour change is likely to occur massively only when the social norm will be about saving energy and reducing GHG emissions. Although some progress is under way, the social norm is not yet on this track in most French public universities. As social norms change only in the medium-long term, much time may be necessary to have all university members on board the climate change mitigation train. Lack of institutional incentives for faculty members to act may lie in the way they are evaluated by the head of their institutions. In France, faculty members’ overall performance mostly depends on the research produced and published. Although the French system is probably extreme, universities anywhere else weigh research and teaching activities primarily. Service to the university, which comprises climate-friendly initiatives, is weighed to a lesser extent. As faculty members who significantly contribute to hands-on initiatives on their campuses don’t have as much time as their peers to carry out research, they will inevitably be less favourably evaluated. As a result, only those faculty members who are highly motivated by other interests than career promotion may get involved in climate-friendly initiatives. University budgets are very tight, even more so in French public universities which can only rely on –very tight- public funding. As a result, investment decisions are frequently made based on the lowest investment costs, which generally deliver only very poor energy efficiency in new buildings or new heating systems. Hardly any consideration is given to the next twenty future years that could save operating expenses and bring a return on investment if an alternative, more costly but also more energy-efficient investment was implemented in the first place. Lack of involvement from the head of the university may prevent a climate-friendly initiative from taking-off or expanding its achievements. As already underscored, support from the head of the university (the top decision-makers) is absolutely necessary. Coordinators officially and openly supported by the President’s office may require staff to act in the exercise of their duties; if coordinators don’t have this support, their requests may not be deemed legitimate by some staff members, therefore be rejected. Regular internal communication by the head of the university about their global support to the initiative is also very important: when university members regularly hear from the involvement of their institution and get to know the achievements, they may want to board the train of expertise, advice and actions. This section has dealt with the motivations and barriers towards climate-friendly initiatives in universities. Most of the motivations and barriers mentioned apply to any institutional context (corporation, public institutions, non governmental organizations, etc…). All of them help us to explore paths that could get individuals to adopt a low-carbon behaviour. The aim is to identify options that could change positive attitudes into low-carbon behaviours, and overcome the barriers described above. The social sciences literature, be it from economics, sociology, psychology, or marketing brings valuable contributions and may open new research pathways. One of the core assumptions of standard economics is that the individual’s behaviour is rational, and selfish. When dealing with a global public good such as climate, this entails that the individual will invest in climate change mitigation actions only if the monetary benefits drawn from the actions outweigh the costs. However, some university members take climate mitigation actions, although they can’t expect any personal monetary gain. Real world situations clearly show that individuals’ rationality is bounded. What factors may lead individuals to take action although they know that they won’t get any monetary gain from it? The hypothesis of a pro-social behaviour as a driver of individual climate mitigation action may deserve attention from economists. A pro-social behaviour may be defined as a voluntary, intentional behaviour that aims to help the others. Although social psychologists have studied pro-social behaviours for several decades, economists have started exploring the field only in the 1990s and 2000s. S. Meier’s extensive review of the economic literature in this respect points to the various hypotheses that may explain an individual’s pro-social behaviour when the individual faces the choice of monetarily contributing to the supply of a public good. A first hypothesis relates to the “external reward” (eg gift, personal prestige) as a “selective incentive”. This hypothesis can actually be seen as an extension of standard theory: self-interest is the motivation. Hypotheses of a second type go beyond self-interest: they assume either pro-social preferences, or reciprocity. The pro-social preferences hypothesis refers to individuals who express their preferences as a function of the well-being of others in some situations: altruism, internal reward, or inequality aversion may be the drivers of such a behaviour. The reciprocity hypothesis suggests “conditional cooperation”: an individual will contribute to a public good only if the others do so too, and his (her) contribution will be proportional to the others’. This second type of hypotheses may occur only if the institutional environment is favourable, thus depending on the political, social and legal rules at play. To our knowledge, the pro-social behaviour of individuals taking climate-friendly actions hasn’t been explored yet, although the motivations from university members to act may well have the same roots. Carrying out research along this path may be highly fruitful, as climate is a global public good that comprises specific features, relative to a standard public good. Sociologists point to the importance of social norms, social support, and social network as drivers of individual actions, although these factors are often underestimated by people. For example, lots of people will turn to an energy-saving behaviour if energy management becomes the social norm, or if it is a social concern shared by their community, or if the social network to which they belong identifies this behaviour as standard. In this respect, information and educational campaigns, as good as they may be, are not sufficient to change people’s behaviour. Bartiaux et al. emphasize that those campaigns may have much more impact if energy savings advices are first debated with and corroborated by relatives or friends. It is clear that, depending on the individual’s social group, the same factors and arguments may have a lever effect or be a barrier. Therefore, it is essential to analyse the socio-technical and cultural context in which individuals live and work. Change management to alleviate resistance to change may also benefit from this analysis. The social norm is obviously moving fast towards more sustainability in North America – hence also towards less-carbon intensive university campuses. Still, French universities lag way behind. In this context, the research contribution of sociologists could consist in identifying the main social groups and the main social norms at play in public universities, in order to get more university members involved in climate mitigation initiatives. Conditions for the rise of a new social norm towards energy management and climate change mitigation actions could be explored. Psychology is obviously a field that greatly helps to understand individual behaviour, and may suggest ways to spur individual motivation for individual climate change mitigation actions. Recent developments in cognitive psychology deserve special mention, as climate mitigation actions represent an interesting field of experiment in this respect. Joule et al. have extensively explained how “the psychology of commitment” is a way of getting more people committed to a specific action, whatever action is considered. The aim is to obtain people’s voluntary commitment without imposing it. Various procedures may be adopted. The “foot in the door” technique is certainly the best-known tool : people are first invited to accept a minor request, without pressure; if they accept to fulfil the minor request, empirical studies show that the probability for them to accept a larger request thereafter significantly rises. Other techniques include statements such as “you are free to accept or refuse my suggestion”: again, empirical studies show that individuals accept more frequently to fulfil the suggested request if they are clearly told that they are free to decide. Experiments could be carried out in some universities by social psychologists in order to identify which technique brings the higher number of individual commitments to act against climate change. Results may obviously differ from one campus to the other, depending on the socio-technical and cultural context. Exploratory research programmes suggested above in economics, sociology and psychology can resonate to marketers in two ways. First marketing may contribute to enhance a pro-social behaviour and spread a new social norm through community-based social marketing for example. Second, getting university members to board the train of expertise, advice and action requires much institutional communication from the university. Marketers need to define an efficient communication strategy, ie a strategy that results in an increasing number of members individually acting towards climate change mitigation. We address these two points below. The global aim of community-based social marketing is that individuals of a community develop a sustainable behaviour within their community. Various tool sets are suggested by McKenzie-Mohr et al. The first one is similar to the techniques advocated by the psychologists of commitment. A second set uses repeated visual or oral messages, so that individuals don’t forget to adopt a virtuous behaviour (eg turn the light off when leaving a room). A third set advertises the desired behaviour as the obvious social norm of the community: individuals who are part of the community may feel prompted to adopt the social norm advertised. Finally, incentives, personal rewards visible by all the members of the community may also be used to drive behaviour change. As a matter of fact, this last tool set may help economists test the pro-social hypothesis of individuals taking climate change mitigation actions in universities. In terms of communication, it is clear that the quality of the messages determines the efficiency of a campaign. A message is efficient if people understand it, remember it and are induced to act to mitigate climate change. Messages must be adapted to the targeted audience, account for their knowledge level, their current attitudes and behaviours. Analyses of various campaigns to fight against climate change underscore that alarmist messages may overwhelm individuals who may perceive the challenge so insurmountable that they are unable to do any action. A similar result may stem from campaigns advocating easy actions (eg turn the light off when leaving the room), as messages may sound too simple, or even boring . Marketing researchers may cooperate with other social scientists to test the efficiency of different communication techniques and messages under specific socio-technical and cultural contexts. Actors of climate-friendly initiatives in universities are generally not numerous. Various motivations drive them to act. But many barriers prevent the majority of university members from participating. Still the commitment of every member is urgently needed in the current context of climate change. How can university members be led to act, how can the invitation to get aboard the train of expertise, advice and actions turn into actual boarding? Given the complexity and intricacy of the drivers and barriers to act, there is no straightforward answer. Research in social sciences may open pathways. However, digging alternatively into economics, sociology, psychology, or marketing is not sufficient to entice behaviour change, as economic, sociologic, psychological and marketing issues are obviously interwoven. Adopting an interdisciplinary approach drawing simultaneously on those social sciences may bring better results. This calls for the definition and implementation of an interdisciplinary research program. US Department of State. Energy efficiency, The First Fuel, eJournal USA, 14, n°4, April 2009, 26. Carlsson-Kanyama A., Pipping Ekström M., and Shanahan H. “Food and Life Cycle Energy Inputs: Consequences of Diet and Ways to Increase Efficiency,” Ecological Economics, 44, 2003, 293-307, 300. All along this paper, a climate-friendly « initiative » is a set of coordinated actions to mitigate climate change. It differs from a “project” in the sense that a project is limited in time, ie has a predefined timeline with a clear deadline. A climate-friendly « initiative » goes beyond a climate action plan as it is not only about strategic planning, but also about acting. See for example, Cohen S., States of Denial: Knowing About Atrocities and Suffering. (Cambridge: Polity Press, 2001) about the denial of human rights violations, and Marshall G., “The Psychology of Denial: Our Failure to Act Against Climate Change,” The Ecologist, September 22, 2001, and his blog at http://climatedenial.org/, about the psychology of climate change denial (accessed September 1, 2009). HSBC, “The Climate Confidence Index 2007,” http://www.hsbc.com/1/PA_1_1_S5/content/assets/newsroom/hsbc_ccindex_p8.pdf (accessed September 1, 2009); Leiserovitz A., Maibach E., Roser-Renouf C., Global Warming’s « Six Americas », An Audience Segmentation, Yale project on climate change, George Mason University, Center for Climate Change Communication, (2008); Ademe, “Le réchauffement climatique : une prise de conscience grandissante du grand public,” La lettre Ademe et vous, Stratégies et études, 9, 7 février 2008. Stoll-Kleemann S., O’Riordan T., and Jaeger C., “The Psychology of Denial Concerning Climate Mitigation Measures: Evidence From Swiss Focus Groups,” Global Environmental Change 11, (2001): 107-117. Stoll-Kleemann, O’Riordan, and Jaeger, “The Psychology of Denial”, 112. The reasons listed above have been collected from students, staff and faculty over the years of the ongoing climate-friendly initiative conducted at the university of social sciences in Grenoble. For an extensive survey of the literature, see for example Norgaard K.M., Cognitive And Behavioral Challenges In Responding To Climate Change, Policy Research Working Paper 4940, the World Bank, May 2009. See for example : Ademe, “Le réchauffement climatique” ; Leiserovitz A., Maibach E., Roser-Renouf C., Climate Change In The American Mind; Americans’ Climate Change Beliefs, Attitudes, Policy Preferences And Actions, Yale project on climate change, George Mason University, Center for Climate Change Communication (2009). For example, the European poll conducted by LogicaCMG reveals that 69 % of the French deem that the investments costs needed to generate substantial energy savings (eg home insulation) are too high. See LogicaCMG, Economie d’énergie: les Français en manque d’information. Résultats d’une étude européenne (2007 ),http://www.logica.com/economies+d%92energie+:+les+francais+en+manque+d%92informations/400009074 (accessed September 1, 2009). Staff members do generally pay for their commute expenses, though. But commuting costs are often perceived as fixed costs, for which people can’t do anything about, but accept them. A 20%-weight for “service” is typical in the overall evaluation of faculty members in US universities. Meier S., The Economics Of Non-Selfish Behaviour: Decisions To Contribute Money To Public Goods, (Cheltenham: Edward Elgar, 2006). This very brief overview of pro-social behaviour is drawn from Meier’s extensive survey: Meier, The Economics Of Non-Selfish Behaviour, chapter 2. See for example: McKenzie-Mohr D., and Smith W. Fostering Social Behaviour: An Introduction To Community-Based Social Marketing, (Gabriola Island: New Society Publishers, 1999) ; Bartiaux F., Vekemans G., Gram-Hanssen K., Maes D., Cantaert M., Spies B., and Desmedt J., Socio-Technical Factors Influencing Residential Energy Consumption. (Belgian Science Policy, 2006). Bartiaux F., Vekemans G., Gram-Hanssen K., Maes D., Cantaert M., Spies B., and Desmedt J., “Socio-Technical Factors”, 137. Shove E., Comfort, Cleanliness And Convenience: The Social Organisation Of Normality, (Oxford and New York: Berg Publishers: 2003). Freedman, J.L., Fraser, S.C.. Compliance Without Pressure: The Foot-In-The-Door Technique. Journal of Personality and Social Psychology, (1966): 4, 195-202. Flay B.R., Burton D., Effective Mass Communication Strategies for Health Campaigns. Mass Communication and Public Health. (Sage Publication : 1990). 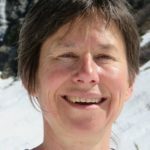 See for example: Moser S.C., and Dilling L., “Making Climate Hot: Communicating The Urgency And Challenge Of Global Climate Change”. Environment, 46 (10), (2004), 32-46 ; Ereaut G., and Segnit N.,. Warm Words: How Are We Telling The Climate Story And Can We Term It Better? (Institute for Public Policy Research, 2006).